Humans have a propensity for yes-or-no thinking; in most ways, a computer is more objective. The only way a human is not prejudiced, or more or less a bigot, is when he or she walks away and stops talking. We want people in the USA, all citizens of the USA, to say, “God bless America,” as if God should take sides and protect us better. More explicitly – in a superior way – we want God to be on our side. Does God take sides? Yet, a person can just be pragmatic. We do not have to be pro or con toward the USA. We can be just bored with the topic. There is so little relevance between how I live my life and the way the othesr in American culture live that it is hard to feel a kinship. My last vestiges of loyalty toward the USA will probably diminish when my mother and father die. Yet again, it is not a black-and-white thing for me. When a Europeans or, more usually, an American starts ranting and berating the USA, I do walk away. Right or wrong, it is my native country and no better or worse than most – and for sure, it is a lot more difficult for me to get thrown in jail in the USA. Listening to rants against the USA is what patriotic people do. The more they rant, the more I know they love the USA. They are angrily defending the USA in a sort of dysfunctional way; they are ranting about a long list of things they want changed. I do not want to change the USA; it is just fine with or without me. And by leaving the country, I vote with my feet. I am not going to give up my passport or driver’s license, but I spend a lot of time figuring out how to only enjoy the benefits and avoid the negatives. Yet, what does a man without a country do? He or she will go about living as citizen of the world, taking the best that each country offers and moving on when experiencing too much of the bad. As a world citizen, we can lick the icing off the top of the cake, and we are never forced swallow the dry cake beneath. I would say you have pretty much succeeded in your quest Andy. I may still live here but my spirit departed long ago. There are many good things about America and I'm one of those who complains and thinks it could be a lot better without that much difficulty if it were not for idiot and those who are corrupt (if not financially, then morally) politicians. I do my best to travel as often as possible to get away from it all and being much older I also complain less and don't even care much what happens here or anywhere else. To enjoy is the main thing and to stay as healthy as possible to do it as long as possible. Good for you Andy, keep on truckin'. "I am making the best of it." This is tolerating a bad situation, which is not saying, "I accept what I cannot change." I want the best of all worlds. Anyway, Andy's travels in Western Africa have piqued my interest and I may give that region a try. Thailand is becomming over touristed, IMHO. The residency requirement is a myth, you do not need to claim residency to live in countries. Having a USA passport, citizenship and residency in two countries means you have double the taxes, double the paperwork. I have live in 90 countries, the word "Residing" is for the most part a scam trying to get you to put 10,000 to 50,000 in their banks. People moving abroad line up to sign up to obey all the rules of a country. In the end, the only one you need is to have your passport stamped, stay the 90 days, and apply for a new visa in ways needed. There a countries where boys are boys, and never want to leave their boom boom girls, and tire of making the visa runs. That is not a world citizen, that is joining the boom boom house. Generally most expats sites want you to buy real estate, and help their advertisers to thrive. There are major Expat real estate sales sites, and working for themselves and expats how purchased real estate and need to pawn it off on the next one coming. 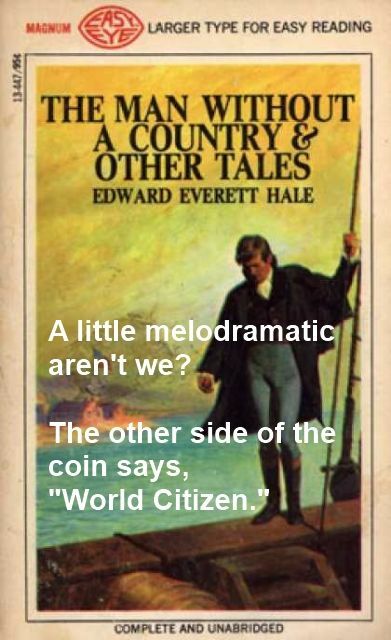 It is not international living as I want, or world citizenship, it is international lying. I reside in Thailand on a Retirement Visa, really a one year extension of stay, renewed annually. I do not "invest" 10 or 20 thousand dollars to remain here. I pay 1,900 baht for a one year extension of stay and $50 for a "Verification of Pension Income" letter to the US Embassy. (Yeah, its a rip off. I do not pay income tax nor am I subjected to double paper work requirements by the Thai government. I've never bought real property in any foreign country. I did however purchase a coffee maker, so now perhaps I shall be forever denied "World Citizen" status. you will not have any problems. Of course in some countries a little under the table payment also is needed. I understand where Andy is coming from but some of us have a desire for having a wife or girlfriend and not bothering with the boom booms. We also enjoy being an expat in one country but still like to travel to other countries for extended periods. We all have different reasons for the travel life style that we pursue and I for one enjoyed going to many different countries when younger now I like staying for 2/3 months and then coming home to friends and family for a while and then to get ready for the next trip. I do enjoy the envy (shame on me?) so many of them have when we prepare to go away again.